Bus Éireann transports thousands of children every day, on both our Road Passenger and School Transport Services. Keeping children safe while in our care is central to the ethos of Bus Éireann; their welfare is of paramount importance to us. 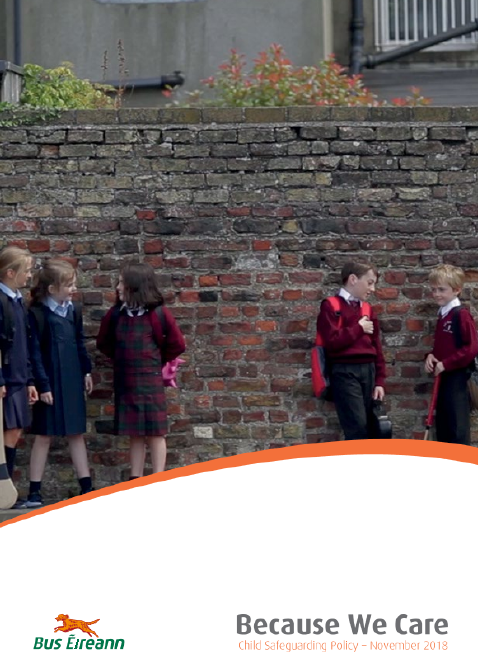 Bus Éireann promotes an environment where children are welcomed, respected, cared for and protected from harm. Our staff, contractors and their employees understand that they have a duty and responsibility to safeguard children and comply with company guidelines and procedures. Our Child Safeguarding Policy and Guidelines are consistent with the principles set out in “Children First: National Guidance for the Protection and Welfare of Children” and are in line with best practice in this area. They have been developed to reinforce our commitment to the safety and welfare of children on our services and to reassure parents/carers of our commitment to the protection and safeguarding of children. Child protection is everybody’s concern and we all have a professional duty and a moral responsibility to ensure that our services are operated in such a way as to maximise the safety and welfare of the children we carry.